The meeting of top U.S. and Chinese diplomats and defence chiefs was held a day after President Trump said Chinese efforts to use its leverage with Pyongyang had failed. WASHINGTON: The United States pressed China on Wednesday to exert more diplomatic and economic pressure to help rein in North Korea's nuclear and missile programs during a round of high-level talks in Washington, U.S. Secretary of State Rex Tillerson said. The meeting of top U.S. and Chinese diplomats and defence chiefs was held a day after President Donald Trump said Chinese efforts to use its leverage with Pyongyang had failed, raising fresh doubts about his administration's strategy for countering the threat from North Korea. The death of American university student Otto Warmbier this week, after his release from 17 months of imprisonment in North Korea, has further complicated Trump's approach to North Korea, which aides have called his top national security priority. 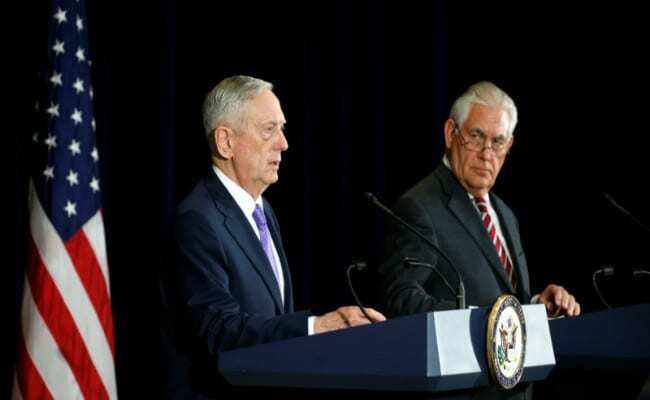 "We reiterated to China that they have a diplomatic responsibility to exert much greater economic and diplomatic pressure on the regime if they want to prevent further escalation in the region," Tillerson told reporters at a joint news conference with Defense Secretary Jim Mattis. But Tillerson also announced that Trump plans to make a state visit to China later this year, signalling that the president seeks improved relations with Beijing despite his frustrations over North Korea. North Korea topped the agenda at the Diplomatic and Security Dialogue, which paired Tillerson and Mattis with Chinese State Councilor Yang Jiechi and General Fang Fenghui, chief of joint staff of the People's Liberation Army. The talks also dealt with issues such as territorial disputes between China and its neighbours in the South China Sea and global counterterrorism efforts. "The United States will continue to fly, sale and operate wherever international law allows," Mattis said, reflecting Washington's determination to counter China's sweeping claims to the strategic waterway. U.S. officials urged China to work with the United States and others to crack down on illicit North Korean activities that help fund the leadership in Pyongyang, and to prevent their companies from doing business with sanctioned North Korean entities, Tillerson said. The United States has made clear it would like to see an oil embargo and bans on the North Korean airline and guest workers among other moves, steps diplomats say have been resisted by China and Russia. Trump has had high hopes for greater cooperation from China to exert influence over North Korea, leaning heavily on Chinese President Xi Jinping for his assistance. The two leaders met in Florida in April and Trump has frequently praised Xi while resisting criticizing Chinese trade practices. "While I greatly appreciate the efforts of President Xi & China to help with North Korea, it has not worked out. At least I know China tried!" Trump wrote on Twitter. It was unclear whether his remark represented a significant shift in his thinking in the U.S. effort to stop North Korea's nuclear programme and its test-launching of missiles or a hardening in U.S. policy towards China. China's Foreign Ministry said earlier on Wednesday that Beijing had made "unremitting efforts" to resolve tensions on the Korean peninsula, not as a result of external pressure but because China was a responsible member of the international community and resolving nuclear issues was in its own interests. On Tuesday, a U.S. official said U.S. spy satellites had detected movements recently at North Korea's nuclear test site near a tunnel entrance, but it was unclear if Pyongyang was preparing for a new nuclear test, perhaps to coincide with Wednesday's high-level talks.